So you finally decided to put an end to all the excuses and buy that tinny you’ve been dreaming about for months, that’s great news! You’ve got the boat, you’ve got the time and you certainly have the want to get out on the water and enjoy yourself. Now you just have to learn how to load a boat by yourself… just in case you decide to venture out on a solo fishing trip. How many men does it take to load a boat? Boat trailers offer many benefits to boat owners but how do they stand up against boat loaders when it comes time to pack up and load your boat? Boat trailers might not be as simple but it can certainly be done! Ideally, you want someone there to help you and speed up the process but it isn’t essential. You can do it by yourself. Follow these steps and you will be out on the water for a solo session before you know it. Sounds like bliss! Step one – ideally you want to be confident (and competent) at reversing a boat trailer because you will have to back it up without a spotter to guide you in and down the boat ramp. Your mirrors will be your biggest asset because they offer the best view of your surroundings, making it easier to keep an eye on obstructions like signs. Step two – reverse the trailer down the ramp until the guards are approx. 12cm under the water. This will vary based a number factors – size and model of boat trailer in addition to whether you are launching in a shallow ramp or not. Step three – drive the boat slowly and carefully onto the boat trailer. Step four – climb over the bow with caution and crank or winch your boat in. Secure it firmly to the trailer and you are ready to go. It is important to remember that these skills take time to develop so patience is a must. Odds are you won’t get it on your first attempt which is why you need to ignore the potential spectators and focus on what you are doing. The more you practice, the more you will be able to fine tune your technique and the faster you will be able to load a boat onto a boat trailer by yourself! TIP: The method above should result in no wet limbs however until you are confident, a set of knee high rubber gumboots will save you getting wet. If loading a boat onto a trailer by yourself sounds too difficult, a boat loader might be an option to consider. While there are definitely some pros to a boat loader over a boat trailer, there are some downfalls as well. One person operated – you can load the boat with a boat loader all on your own. A 12v electric winch will take the manual cranking work out of it for you. You can stand back and control it via a handheld remote. Reversing – you avoid having to reverse a trailer down the ramp, however, this also means that you cannot launch your tinny directly in the water. You will need to manoeuvre the boat from the car to the water and back again when you are finished. No more excuses… with some practice and determination, you’ll be able to load a boat onto a trailer by yourself in no time! It’s time to get out and enjoy fishing and some quiet time out on the water. 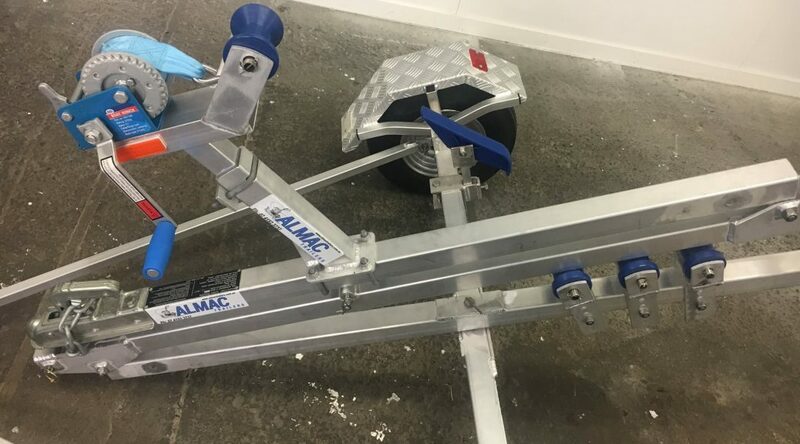 Contact the expert team at Almac Trailers on today on (07) 41523737 for all your boat trailer needs!